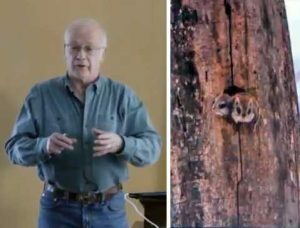 Bob Bancroft is giving a presentation on Forestry in Nova Scotia to the Halifax Naturalists on Thursday June 1 at the Nova Scotia Museum of Natural History, 1747 Summer Street, Halifax, 7:30 p.m. All welcome. View HFN Walks and Talks for details. Bob is known to many as a regularly featured guest on CBC Maritime Noon where he comments on various wildlife topics and responds to questions about wildlife in the Maritimes. He co-authored with Donna Crossland Restoring the Health of Nova Scotia’s Forests, a panel of expertise report on forests for the Nova Scotia Natural Resources Strategy 2010 process. Subsequently the NDP and then the Liberal governments backed off on the commitments coming out of that process, including a 50% reduction in clearcutting. Clearcutting has become an issue in the current election. Bob’s talk, which will be two days post-election, will include “ample time for discussion”. The Conservation Committee of the Halifax Field Naturalists recently prepared a document commenting on the impacts of forestry in Nova Scotia on conservation of biodiversity and asking questions about the underlying science. (View HFN post, Apr 25, 2017). Posted: May 29th, 2017 under Talks.